NAIROBI, Oct 15 2014 (IPS) - For the past 40 years Josephine Kakiyi, 55, has been cultivating maize, beans and vegetables on her small plot of land in the remote area of Kwa Vonza, in Kitui County, eastern Kenya. Even though this has always been a hot and semi-arid region, over the last 15 years Kakiyi has noticed that the rainfall has reduced and become increasingly unpredictable. But farmers all over Kenya, and in most African countries, are facing similar problems. Experts from around the world are certain that climate change is playing a major role in the difficulties Kakiyi and hundreds of thousands of other farmers are experiencing on the continent. All of these phenomena, when combined, may easily create numerous crises on a continent that is expected to double its population to 2.4 billion by 2050. The State of Food Insecurity in the World report, published this year by the United Nations World Food Programme (WFP), the Food and Agriculture Organisation of the U.N. (FAO) and International Fund for Agricultural Development (IFAD), estimates that there is around 227 million undernourished people in Africa — a fifth of the continent’s’ population. Even so, the prevalence of undernourishment in Africa has declined from 27.7 percent in 1990 to 20.5 percent currently. In Kenya, food security is a great concern for at least 10.8 million people, although the prevalence has also shrunk from 33 percent to 24.3 percent over the last 25 years. But what experts still don’t agree on is the extent to which climate change is affecting food security. “Climate change is an exacerbating driver, not the primary cause, of food insecurity and hunger,” Randall Purcell, a senior advisor to the Recovery Unit of WFP in Kenya, tells IPS. And the same applies to rainfall. The IPCC has forecast a slight increase of rainfall in East Africa, but it also expects it to be more erratic and sporadic. So it’s getting harder to tell when, where, and how much it will rain, as farmers like Kakiyi have noticed. A representative of FAO in Kenya, Luca Alinovi, also prefers to be cautious and explains to IPS the difficulties scientists encounter when linking climate change to its consequences. “In most African countries the amount of solid data on weather is very [limited], so it’s very difficult to say for sure if a specific event entails a structural change or it’s only a cycle that repeats itself every few decades. Furthermore, a lot of measurements are not done with ground stations but with estimates,” Alinovi says. Regardless of what the data may prove, the fact is that Kenya has suffered three major droughts since 2001 and the Kenyan government, in collaboration with the World Bank, the European Union and relevant stakeholders, is trying to implement a new approach to address the situation. “The NDMA has established an early warning system at a county level to facilitate the collection of environmental and socioeconomic data so we can activate our contingency plans before the worst effects of drought have even appeared,” Luminari explains. But detection is only half of the solution. The other half is based on prevention. “Climate change can also be an opportunity and not only a threat,” Alinovi asserts. 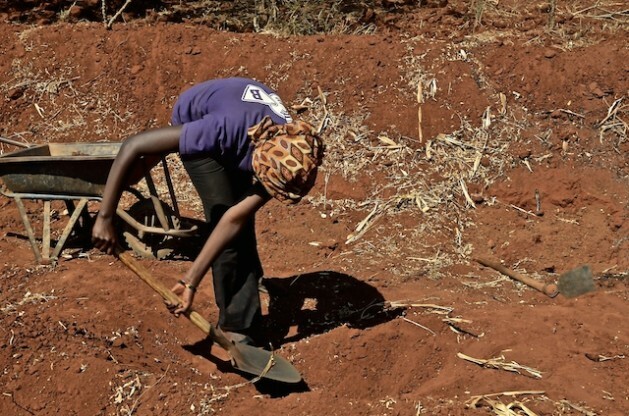 On her plot of roughly 0.3 hectares, Kakiyi has started using zai pits, an agricultural technique exported from West Africa that consists of digging holes that are two feet by two feet. In the pits she puts a mixture of soil and manure to help improve the infiltration of the run-off water from rainy seasons. Using this technique, which is labour-intensive but cheap, Kakiyi has been able to increase the productivity of her plot by 10 times. This is where GMO crops can help also! !